The recipe for this Raw Coconut - Almond Bliss Balls are a classic recipe that I have been making for the past 15 years every Christmas. A classical Christmas recipe that has evolved over time. The original recipe was shared by my biology teacher in secondary school and I have been making them ever since. The adapted version is now fully raw and sugar free and very easy to make. 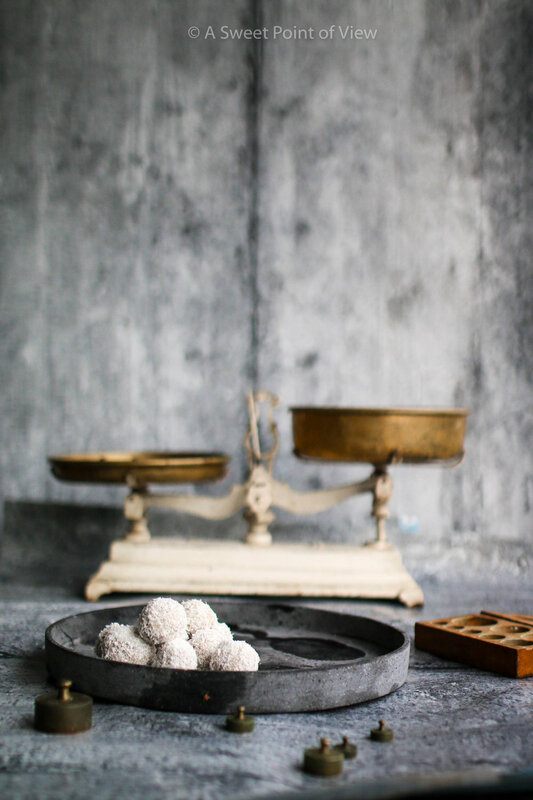 These Coconut Bliss Balls might be the healthiest Christmas Treats that you will ever eat. Beside all the extra calories eaten during Christmas, these Bliss Balls are a nice alternative. No guilty feeling and surely no regrets after eating a handful of these balls. The great thing about them is that they are made fast and can be on the last minute to do list. The most important thing though is to store the Bliss Balls in the Refrigerator at all times as anything raw easily perishes in the warm indoor heat during the winter. Simple Christmas Recipes with only three ingredients. Mix all the ingredients together and leave in a bowl over night. Roll medium sized balls and put one halve almond in the balls. Then cover with the remaining coconuts. Then refigerate the Coconut - Almond Balls.